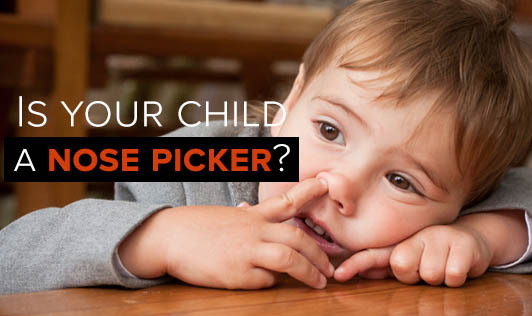 Is your child a nose picker? It is not uncommon to see children with their fingers inside their noses. Children pick their noses for various reasons. It can be because there is something in the nose which is disturbing or it could be curiosity, boredom, a nervous habit or a stress reliever. If your child is constantly picking his/her nose, it could be because of an allergy. However, sometimes, heavy running mucus can crust up inside the nose making it difficult not to pick and clean it. Most children stop this habit by the time they reach adulthood either because they lose interest or because their friends tease them. This forces them to stop. • Clean their nose - A clean nose will reduce the number of times your child picks his/her nose. • Keep them busy - Give them some small work like picking up things or helping you with some work. If you can identify the times when nose picking is at its highest, like while watching tv or during travel, give them some toys to play with to keep their hands occupied. • Teach them to use a hand kerchief/tissue - When your child has a running nose, hand them a tissue or hand kerchief and teach them how to use it to prevent them from using their fingers. • Washing hands - Each time your child picks his/her nose, make it a point to tell them to wash their hands. No child likes to wash their hands frequently, so the nose - picking habit will automatically come down. • Tend to the allergies - If your child has allergies which is causing a running nose, take him to a doctor. • Meet a doctor - If your child is picking his/her nose compulsively, check for blood. If nose- picking is coupled with nail biting, thumb sucking or inadequate sleep, consult with a pediatrician or a children's therapist. So, the next time your child is nose-picking, you know what you have to do!